From the what's this white stuff department... 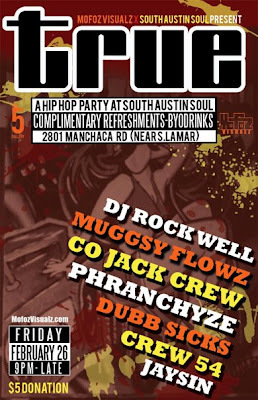 TRUE presented by Mofoz Visualz and South Austin Soul @ South Austin Soul on Feb 26th! MOFOZ VISUALZ and SOUTH AUSTIN SOUL present TRUE. A night of Hip Hop with a house party vibe...just like the good ole days. Phranchyze, Dubb Sicks, Crew 54, Jaysin and Muggsy Flows of The Word Association and hip hop band CO Jack Crew ( feat Khalil formerly of Breakfast Club Crew)...all this and the homie DJ Rock Well holding down turntable duties. This event will start at 9pm and go on til it stops....some say it never stops.